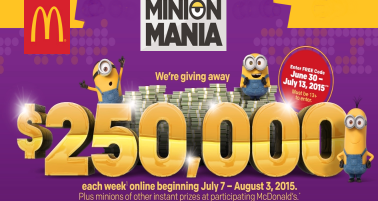 McDonald’s Minion Mania Sweepstakes – Win $250,000! ENTER SWEEPSTAKES HERE – McDonald’s Sweepstakes page. You can find codes on certain foods at McDonald’s or Week One and the Final Week you may use the free code: MINIONMANIA. A Participant can request a Game Piece without purchasing a Food item at a participating McDonald’s location by mailing a legibly handwritten, self-addressed, stamped envelope (“SASE”) with sufficient postage and a return address, including first and last name, street address, city, state and ZIP or postal code, to: McDonald’s Minion Mania Game Piece Request, P.O. Box 49250, Strongsville, Ohio 44149-0250. Two (2) Game Pieces will be mailed in response to each mail-in request that complies with the requirements of these Official Rules, while supplies last. Mail-in requests, including both outer envelope and SASE, must be handwritten. Outer envelope must include a return address in the upper left hand corner that matches the requestor’s street address, and must be postmarked no sooner than June 23, 2015, and no later than August 3, 2015, and received by Sponsor no later than August 10, 2015. ENTRY LIMIT – There is a limit of one (1) Registration per Participant. There is a limit of ten (10) Code Entries each Day (the FREE Code does not apply to the daily limit, and Participants are only allowed to enter (1) FREE Code). ELIGIBILITY – The Game is open to individuals who are residents of the Territory and are thirteen (13) years of age or older at time of participation. SWEEPSTAKES PERIOD – Online Sweepstakes Entry begins at 12:00:00 a.m. ET on July 7, 2015, and ends at 11:59:59 p.m. ET on August 17, 2015, and includes five (5) separate Sweepstakes Entry Periods. PRIZES – In-Store Game Food Prizes: The ARV for McDonald’s Food prizes are based on Sponsor’s average menu board prices as of March 1, 2015: Premium Chicken sandwich, ARV: $4.69, Odds: 1 in 121; Quarter Pounder® w/Cheese sandwich, ARV: $4.07, Odds 1 in 121; Small Fries, ARV: $1.26, Odds: 1 in 61; Chicken Snack Wrap®, ARV: $1.78, Odds: 1 in 121; Sausage McGriddles®, ARV: $2.49, Odds 1 in 61; Medium Soft Drink, ARV: $1.34, Odds 1 in 31; Small McCafé® Smoothie, ARV: $2.53, Odds 1 in 61; Fruit ‘N Yogurt Parfait, ARV: $1.00, Odds 1 in 61; Large Iced Coffee, ARV: $2.04, Odds: 1 in 61; Sundae, ARV: $1.27, Odds 1 in 41. A “Despicable Me 2” 3-Mini-Movie Collection Download. One Hundred Thousand (100,000) prizes available. Each winner will receive one (1) “Despicable Me 2” 3-Mini-Movie collection (main featurettes only) digital download, ARV: $4.99. Odds of winning are approximately 1 in 3,613. A “Minions” Movie Ticket via Fandango. Two Hundred Fifty Thousand (250,000) prizes available. Each winner will receive one (1) Fandango Promo Code, valid for one (1) movie ticket (up to $13 including Fandango fees) to see “Minions” between July 10 and September 30, 2015, at a participating theater, ARV: $13. Odds of winning are approximately 1 in 1,446. A “Despicable Me 2” Movie Download. One Thousand (1,000) prizes available. Each winner will receive one (1) “Despicable Me 2” (main feature only) digital movie download, ARV: $14.99. Odds of winning are approximately 1 in 361,296. A Fifty Dollar ($50) Arch Card®. Seven Hundred Eighty (780) prizes available. Each winner will receive $50 in Arch Cards. Odds of winning are approximately 1 in 463,200. A Trip to Universal Studios HollywoodSM. Fourteen (14) prizes available. Each winner will receive a four (4) day, three (3) night trip for four (4) to Universal Studios Hollywood (“USH”) and a check for $500, ARV: $4,600. Odds of winning are approximately 1 in 25,806,820. A Trip to Universal Orlando® Resort. Fourteen (14) prizes available. Each winner will receive a four (4) day, three (3) night trip for four (4) to Universal Orlando Resort, and a check for $500, ARV: $6,200. Odds of winning are approximately 1 in 25,806,820. This prize is subject to Trip Conditions below. A Trip to an NBC Sports Hosted Experience. Twenty-Six (26) prizes available. Each winner will receive a three (3) day, two (2) night trip for two (2) to attend a live action NBC Sports event that may or may not include an NBC Sports televised event such as NBC Sports televised hockey playoff game, professional football game, auto racing event or championship golf event, in Prize Partner’s sole discretion, and a check for $500, ARV: $4,200. Odds of winning are approximately 1 in 13,895,980. A Trip to a Taping of an NBC Broadcast Show Experience. Twenty (20) prizes available. Each winner will receive a three (3) day, two (2) night trip for two (2) to attend a taping of an NBC Broadcast Show from a selection of NBC shows in NBC’s sole discretion (e.g., “America’s Got Talent”, “The Voice”, or “American Ninja Warrior”), and a check for $500, ARV: $3,200. Odds of winning are approximately 1 in 18,064,774. Week 1, 2, 3 & 4: Two Hundred Fifty Thousand Dollars ($250,000). One (1) prize available for each Week. Each winner will receive a check for $250,000. The odds of winning will depend on the number of Entries received for each drawing. Final Drawing: A Trip to Universal Orlando® Resort. One (1) prize available. The winner will receive a four (4) day, three (3) night trip for four (4) to Universal Orlando Resort and a check for $500, ARV: $6,200. The odds of winning the prize will depend on the number of Entries received during the entire Online Sweepstakes Period.